I do know that my blog has a wide readership, but I didn’t expect my feature on a holiday gone bad, to go viral. It prompted a reporter named Shahkar Abidi, from DNA to reach out to me for an article he planned to pen down regarding this most unfortunate incident. The indiatimes did their own investigation and carried it on their site which also triggered off a multitude of tweets reprimanding the airline. However what was hoped for most, but was honestly totally unexpected, was the airlines response. I got a call the very next day after my blog went viral, assuring me of quick action. What was further reassuring was the fact that the senior officials from Jet Airways, accepted that their staff in both Muscat and Mumbai had failed miserably in handling this sensitive situation appropriately. They assured me that corrective measures would immediately be taken to adequately compensate all passengers who suffered at the hands of a few insensitive Jet employees. I was further promised that the badly behaved and insensitive ground staff, who so very callously handled the many valid and genuine passenger requests, would be severely reprimanded and bought in for counselling. Over the next couple of days I answered several calls from senior level executives from Jet Airways. Although most calls repeatedly highlighted the many aviation rules which had to be followed, given that the sand storm was an act of God, a few were calls assuring me that there would be immediate improvements in customer management processes. Although many passengers did connect with me and voiced their appreciation for my efforts, after reading my blog, I was particularly moved by one story. Hena Shah from Vadodra, Gujarat, was excited to be travelling to Dubai with her parents and older brother. She had pre-purchased tickets to swim with the dolphins and visit the Burj Khalifa. This young girl narrated her story to me on the phone and said, that after the initial ordeal which saw her family and her back in Mumbai after the 13-14 hour journey, the Jet staff at the international airport in Mumbai said that they could board the early morning flight to Abu Dhabi. Her father Kamlesh Shah, asked if the Jet ground staff was sure their visas to Dubai would be accepted at Abu Dhabi, to which they were assured that the Abu Dhabi immigration would indeed accept their visas. This family of four spent the night at the Mumbai airport and took the 5 am Jet flight to Abu Dhabi. At the immigration counter at Abu Dhabi, the officer stopped them and said that their visas were not acceptable as they had been issued by the Dubai Marhaba. 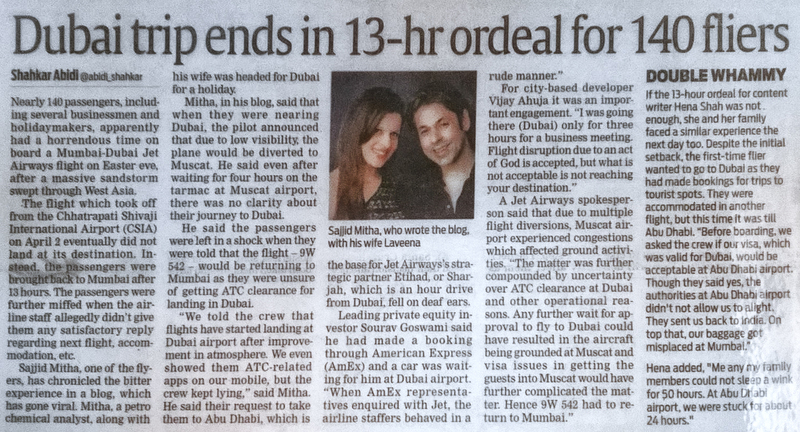 The Shah family had to spend the entire day at the Abu Dhabi airport and catch a late evening flight back to Mumbai. Just when they thought their horrors were finally over, on returning to Mumbai they realised that their baggage had been misplaced by the airline. What tugged at my heartstrings was when Hena said that this was her first flight abroad. I promised her at the end of the conversation that I wouldn’t rest till she was more than adequately compensated. When Shahkar, the reporter from the DNA called, I asked him to speak with Hena too as I wanted her case to be highlighted in print. Many of those writing in to me after reading my blog, warned that Jet made promises and didn’t keep them. I believed that if Hena’s case was in the papers, it would strengthen her claim if heaven forbid, Jet really did turn it’s back on us. 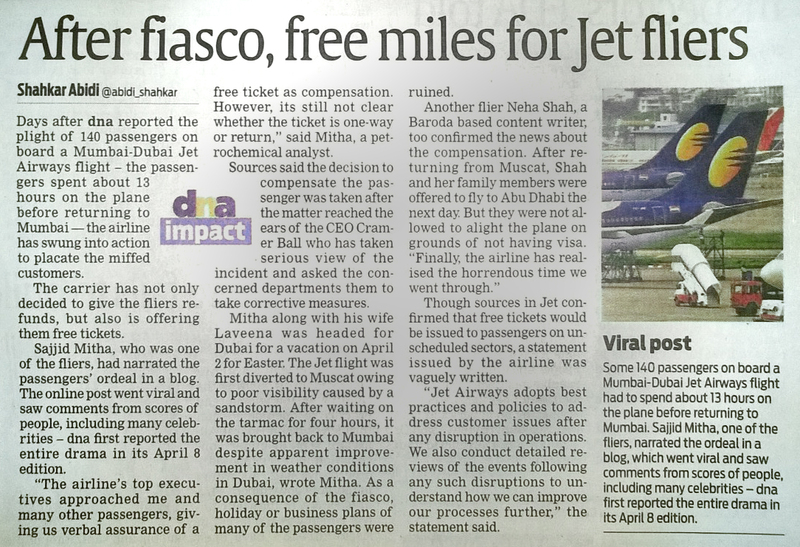 This morning, there is a follow up article that has appeared in the DNA confirming that the newspaper too has been in touch with Jet and that the airline has confirmed compensation to all passengers. Hena too contacted me and said that the airline did issue them free tickets to Dubai and they were off for their vacation on the 30th of April. While I sigh in relief, I am grateful that I could play my little part in helping so many who were genuinely distressed by the events of that day. Thank you Jet for your pro active and positive quick action and I sincerely do hope you will keep your promise. Previous Post Djuronaset – a Little gem on my Swedish journey! We now live in a world where if you don’t escalate ..nothing is done. Kudos to you for being so outspoken. Huge corporations do not care much about the consumer except to obtain their business and money. If the service is deficient in any way, more often than not the consumer runs from pillar to post and is simply ignored. Good customer service is barely existent. Dear Sajjid, I am so happy that you got justice for all the passengers and also made it possible for the airline to realise it’s flaws and the power of social media. It will benefit the passengers who travel in the future. Bravo! Jet has been slipping considerably in the last year and good your ‘wake up call’ got attention. Hope in addition to the new ticket’s for Hena, all the other passengers are also now received compensation and most of all – compassion with an apology.